Toe spacers can help you keep your toes separated during a pedicure, so that your newly painted nails do not smudge. They can also help separate your toes for Yoga, running or because of foot joint issues. 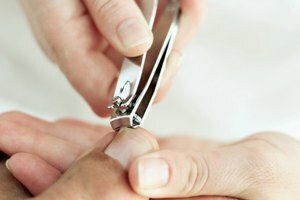 If you don't have any toe spacers handy, and sticking a cotton ball between your toes isn't a comfortable option for you, you can make your own toe spacers at home. In order for your spacers to be effective, you should first consider whether you plan on wearing the toe spacers barefoot or inside of your shoes. Select a spongy craft foam at the craft supply store. The foam should be between 1/2-inch thick in order to provide adequate space between your toes. Place your bare foot on top of the foam. Mark the width of your foot on the foam with a pen. This allows you to gauge how wide to make the spacers. Remove your foot from the foam. Draw five pegs in the craft foam between the two pen markings. Start by drawing a peg, then drawing a dip, then another peg, then another dip, until you end with a fifth peg and four total dips in the template. Cut out the foam spacer template with your craft scissors. Cut out the grooves in the spacer where the dips are drawn. Insert the pegs in between your toes. The outer peg should be placed on the outside of your big toe, with the pegs, or spacers, in between the other toes. Place your foot flat on the ground. See if you need to cut the underside of the spacers to make it lay flat. Trace a second spacer template into the foam for your other foot.